The Ham known by the PGI as Jamón de Trevélez brings together several aspects that sets it apart from other types of ham. It is a product made in a traditional way in an enclosed geographical surrounding which gives it characteristics and qualities that make it unique. 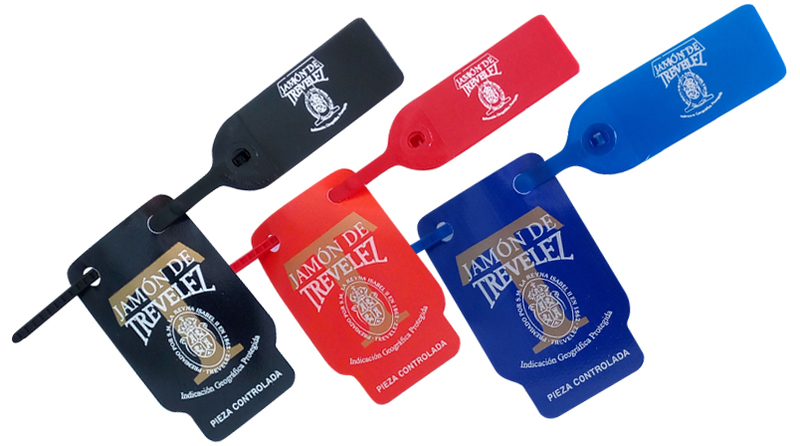 The production area for the PGI «Jamón de Trevélez» is a natural environment where factors such as altitude, temperature and humidity, amongst others, combine to give the product the unique qualities which have traditionally characterised it. The production area comprises sections at more than 1,200 metres in the municipalities of Trevélez, Juviles, Busquistar, Pórtugos, La Tahá, Bubión, Capileira and Bérchules in the province of Granada. This production area is located on the south face of Sierra Nevada, in the higher part of the Alpujarras and within the Sierra Nevada National Park. The production process is done in a traditional way and ham is cured naturally. Only companies within the enclosed area that are listed on the Regulatory Board Register can produce «Jamón de Trevélez». All of the companies listed on the register have specific curing and ageing facilities for the products. They have an adequate ventilation system, which prevents drafts and ensures fresh renovation of air. They must meet the conditions that guarantee the correct ageing of the product in a natural environment. Both the listed companies and the products themselves are subject to strict quality controls throughout the process. The type of meat suited for the production of legs intended for processing into the PGI «Jamón de Trevélez» ham is from pigs obtained from crosses of the breeds Landrace, Large White and Duroc-Jersey. The legs are taken from castrated males or females. Only legs with the semi-membranous muscle pH of between 5.5 and 6.4 can be used for the production of legs under Jamón de Trevélez PGI. For the production of protected ham, only legs with a subcutaneous tissue measures: minimum 1cm with fat infiltration for weights less than 12.3 kg, a minimum of 1.5 cm with fat infiltration for weights between 12.3 and 13.5 kg, and a minimum of 2 cm with fat infiltration for weights over 13.5 kg. Legs weighing between 11.3 kg and 12.3 kg for the first category. Legs weighing more than 12.3 kg and up to 13.5 kg for the second category. Legs weighing more than 13.5 kg for the third category. Dependiendo del peso del jamón en fresco, se establece una curación mínima exigida a cada categoría. Categoría 1: Curación mínima de 14 meses. Categoría 2: Curación mínima de 17 meses. Categoría 3: Curación mínima de 20 meses. 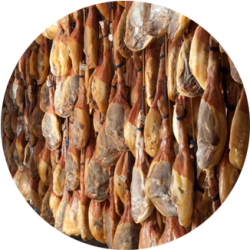 At the end of the curing process, hams must shrink by at least 35%, or be cured for at least 3 months more than the minimum laid down for each of the weight categories, therefore reaching a minimum curing period of 17, 20 and 23 months. 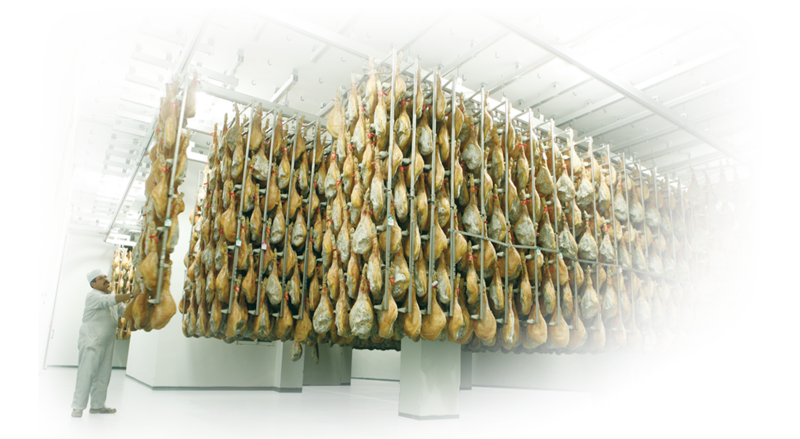 Usually, the final classification of PGI ham is carried out after the minimum curing period plus the additional three months, the only exception being the classification of pieces by shrinkage. The pieces covered by Jamón de Trevélez PGI must have a natural level of salinity, that is less than or equal to 5% (expressed in % of sodium chloride). All the suitable pieces carry an alphanumeric inscription, which identifies the piece and which is maintained throughout the whole the process. This alphanumeric form of identification is registered by the Regulatory Board. Each suitable piece is also identified by the guarantee stamp, which can be blue, red or black and controlled by the Regulatory Board. The final classification of ham is carried out by a final quality control and verification, to check that all requirements are met. Each piece must be accompanied by its alphanumeric identification and its coloured seal. This individual seal, along with the alphanumeric identification, constitutes the product’s authenticity test. 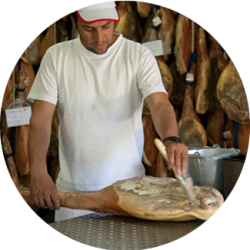 Jamón de Trevélez is commercialised with registered brands, by the companies listed on the Regulatory Board Register. 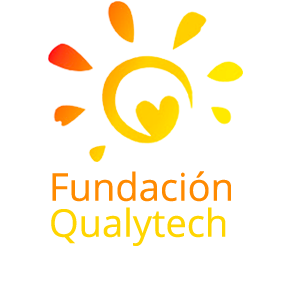 In the final labelling of the covered product, the mark of conformity, the PGI logo, must be included, which must occupy at least 50% of said label, along with the registered trademark logo and the company logo of the certification company Fundación Qualytech Alimentación.